Tim Noakes, a well known exercise scientist, recently wrote a review on the role of the brain in limiting exercise performance. It's a good read, more of a history lesson of the theories than a description of particular experiments. He argues at length, with clear annoyance in his words, how the science of fatigue has been dominated for the last ninety years by the role of the heart. The theory, created by Archibald Hill (told you it was old), states that during maximal exercise the muscles start to require more oxygen than the heart can provide. The muscles become anaerobic and start accumulating lactic acid. The heart then reduces pumping capacity to prevent damage to itself. In this model, the heart is the limiting factor, since it fails to provide enough oxygen. As both a neuroscience student and a runner, I can't say I agree that this theory is dominant. (Noakes cites articles written as recently as 2008 as evidence that this theory is still prevalent.) Certainly we've all heard about (or felt) lactic acid accumulation and appreciate the importance of the heart pumping precious oxygen, but haven't we also heard about the brain? It's often said that athletes and coaches are ahead of the science. They know what works, and the scientific explanations come later. Of course, I'm brain biased to begin with. There is one theory that Noakes rebukes that I do think is dominant, and that I did believe. According to Hill's theory, VO2 max, the maximum amount of oxygen that can be taken up and used, should be a good predictor of athletic performance. (Even Wikipedia says this.) Noakes cites many acticles (including one written by Peter Snell, the 3 time gold medalist from New Zealand who became a physiologist) to argue that VO2 max actually isn't a good predictor. I understand that VO2 max might not be the only factor in performance but certainly it's one of them, right? But back to the main argument. 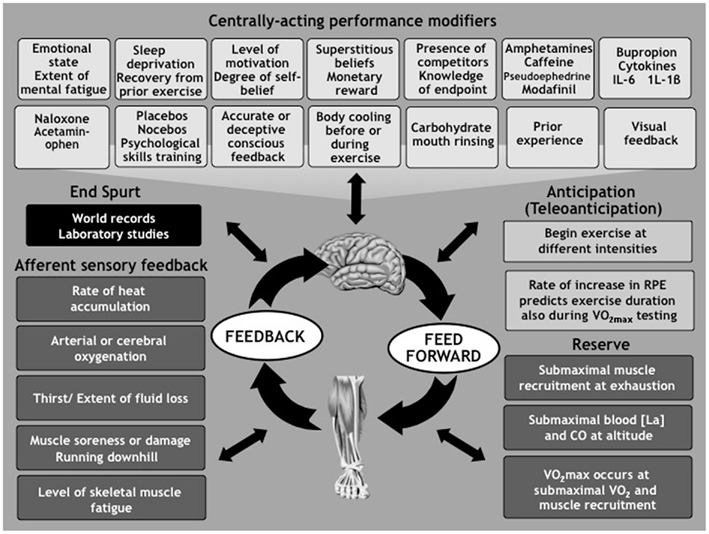 In my opinion, we already knew the brain's role in training and racing well. Noakes provides some evidence to help really drive the point home, such as the fact that people go harder in races than in practice, pointing to an obvious role of the brain and motivation. His best argument comes from observations of athletes at the end of an race. The finish line is in sight and you start sprinting. It doesn't matter if you've run 3 miles or 26 miles, you'll pick up the pace when you're almost done. According to Hill's theory, at this point your muscles and heart should be at their most fatigued point and not able to speed up. But your brain knows you're almost done, and so you can. After convincing the reader of the role of the brain, the question is what can we do about it. How can we be tougher mentally? Noakes doesn't answer this. The answer may be obvious and cliche: believe in yourself and practice that in your training. 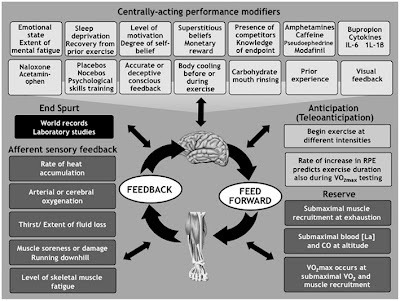 The boxes under "Centrally-acting performance modifiers" in the chart at right show some of the factors that studies have indicated play a role in mind over muscle. Swishing Gatorade in your mouth (not even actually drinking it), trying to win prize money, and seeing the finish line can all fool your brain into feeling better. One thing that struck me personally was at the end. He talks about how, in a close race, it's not physiology that determines the winner, but mentality. He basically says that the loser decides to lose and accepts second place. Yikes, that's a bit harsh. But he goes on: "Especially interesting would be studies of the performance of athletes competing in events in which they do not have any knowledge of the quality of the opposition." I'll admit, I Google-stalked Orange Shirt in a "my marathon is over, what the heck do I do with myself" moment. I found out she used to run for Hansons Brooks and has a 2:35 marathon PR. Are you freaking kidding me? If I had known that, no way would I have gone after her. I would have settled for second, not believing I had a shot. Obviously Orange Shirt wasn't running a 2:35 that day, but if I had know what an amazing athlete she is, I would have mentally given in. And as Noakes argues, that would have been my brain limiting my performance, not my muscles. One of the best parts of the paper is his quotes from famous runners, ranging from Sir Roger Bannister (1st man to break the 4:00 mile, also known as Dr. Bannister, a neurologist) to Paavo Nurmi (a nine time gold medalist.) He throws in some Vince Lombardi and Muhammad Ali quotes for those non-runners. But he's missing Eminem: You can do anything you set your mind to. Would be interesting to measure the mirror image: what happens in your brain while you sit in a chair playing video games or watching TV. Or stuck in a traffic jam. Interesting article I read this morning after my 18 mile warm-up run. And I actually know two authors on the paper! Who to Pick: The Fast or the Faster?